The government has saved Rs 90,000 crore by eliminating the middlemen in its 500 schemes and the Supreme Court judgement on Aadhaar has validated the government, says Amitabh Kant, CEO, NITI Ayog. Over the next 5 years, India will become the first country to make debit and credit cards and ATMs redundant, he told a gathering of India’s business leaders at the 45th National Management Convention of All India Management Association. “One of the biggest innovations the government has done is to make India easy and simple by doing away with human and institutional interventions at multiple stages and that is the principal reason India has jumped higher in the global index of ease of doing business,” Kant said. Kant claimed that the government is 10x ahead of the private sector in technological innovation and the private sector has to keep up with it. He gave the example of rapid roll out of the GST as a disruptive innovation which he said had doubled the number of taxpayers in just one year. He also mentioned Ayushmaan Bharat as a major innovation in healthcare. While the large companies were lagging, a lot of innovation was taking place at the grassroot levels, Kant said. “We are supporting 20,000 incubators and that number will go up to 500,000,” he said. Kant released two research reports done by AIMA in partnership with PwC – one titled How Artificial Intelligence is Reshaping Jobs in India? and the other Disruptive Technologies that can Transform India. Sanjiv Mehta, Chairman and Managing Director, Hindustan Unilever agreed with Kant and said that the government was innovating faster than the private sector. He said that Indian companies needed to breed a culture of experimentation. “Now, the big will not beat the small; the fast will beat the slow,” he said. He added that the organization architecture had to change to make the firms agile and gave the example of HUL which operates with 15 mini boards across the country that have been created to harness the lack of homogeneity of India. Akhil Bansal, Deputy CEO, KPMG in India said that Indian companies must adopt Industry 4.0 technologies because of a rapid addition to the workforce due to more women entering the workforce, more rural people migrating to cities and 1 million young people reaching the working age every month. “Consumption cannot be stopped and with 1.4 billion people, India has to produce in India to support that consumption,” he said. Rahul Gangal, Partner, Roland Berger said that Industry 4.0 technologies such as 3D printing had already reduced the material wastage in auto parts manufacturing from a ratio of 9:1 to 1:1. “The payback period for robotics in the auto industry has fallen to just one year from 5-6 years earlier,” he said. Ravi Uppal, Former Managing Director and Group CEO, Jindal Steel & Power, argued that though automation was driven by the ageing countries, India had no choice but to integrate with the Industry 4.0 trend. “Existing companies can defend their position only for a short time by going to the government but trade barriers cannot last long,” he said. 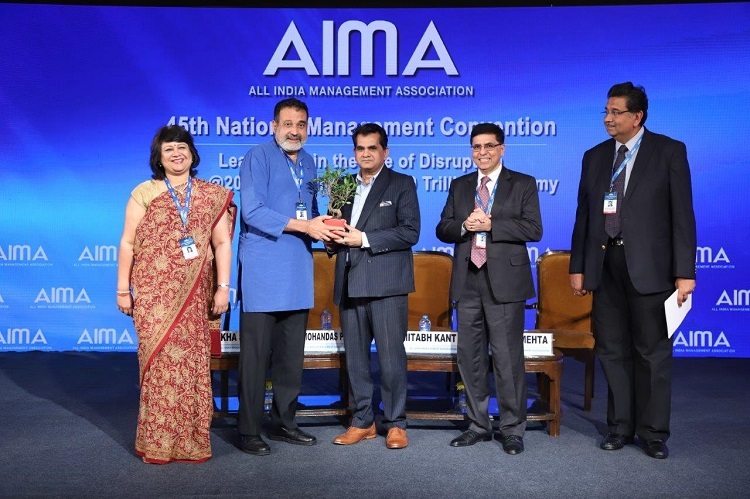 TV Mohandas Pai, President, AIMA pointed out that the labour laws would not apply to the automated industries as their workforce will be highly skilled. At the same time, he said that India needed local finance to promote tech-driven enterprises. “We need India’s Soft Bank to provide the risk capital,” he said. The National Management Convention ended with the presentation of the Best LMA Awards for 2017-18. AIMA has 65 local management associations (LMAs) as its affiliates and each year it felicitates the best performing LMAs. Madras Management Association received the National Excellence Award while Ahmadabad Management Association was adjudged the best large LMA. Lucknow and Baroda associations were found to have performed the best at the next two levels and Chandigarh won in the small association category. Navsari Management Association received the award for being the most improved LMA. The 2-day convention focused on making India a $10 trillion economy by 2030 by fostering agile leadership in the age of disruption. The convention was chaired by Hindustan Unilever Chairman and Manging Director, Sanjiv Mehta and it was addressed by leading central ministers and CEOs, including Nitin Gadkari, Jayant Sinha, M J Akbar, Baba Kalyani, Dilip Piramal, Kishore Biyani, Sanjay Kirloskar, Preetha Reddy, Sunil Kant Munjal, Sudhir Jalan, Harshavardhan Neotia and Ravi Uppal. Spiritual guru, Sri Sri Ravi Shankar also addressed the convention.